The dramatic beauty of Italy’s Amalfi coast can leave people speechless. So perhaps it’s natural that a leading producer of Amalfi coast wines has difficulty speaking about them. But if most pictures are worth a thousand words, the panorama directly out the door of Cantine Marisa Cuomo counts for a million. In sparsely populated Furore, about 30 miles southeast of Naples, centuries-old cliffside terraces holding pergola-trained vineyards, lemon trees, olive groves and tiny family farms drop to the sea about 1,500 feet below. You might call it dramatic terroir, but the dolomite rock cliffs and terraces hold little terra (Italian for earth). The vista is all blue sea and sky. Salty, breezy: Call it air-oir. Most of the vineyards are trained on networks of chestnut posts and planted with local varieties on their own roots, the area having been spared from the blight of the phylloxera root louse more than a century ago. It all looks idyllic until you consider the sheer work involved. Use of tractors is impossible. Most work is done by hand by workers who must climb up and down stone steps jutting from terrace walls. The harvest is hiked out of vineyards by workers, carried on the backs of donkeys or, in a few cases, transported by small monorail systems. The vineyards, which average 80 years old, jumble together a half-dozen or more grape varieties, making it impractical to conduct single-variety fermentations. Winemaker Marisa Cuomo learned the craft from her husband's family. Ferraioli’s sprawling family has long been attached to agriculture in Furore, named for its landmark fjord that cuts into the coastal mountains. The family made wine and ran a restaurant and inn here after World War II. But by the late 1970s, as his father’s generation retired, they stopped wine production, and the family's roughly 10 acres of vineyards fell into neglect. In 1980, Ferraioli bought out the relatives who owned shares in the vineyards and old family winery. Three years later, he gifted it all to his new bride, Marisa Cuomo, a local woman with no background in wine. Cuomo, then 20, learned how to make wine from Ferraioli’s family—an exercise she equates to being gifted a new bicycle and having to learn how to peddle. In 1995, the same year the Costa d’Amalfi DOC was created, Ferraioli hired a young consulting enologist from the other side of Campania. The consultant, Luigi Moio, grew into one of the region’s most influential figures and later developed his own Quintodecimo winery. 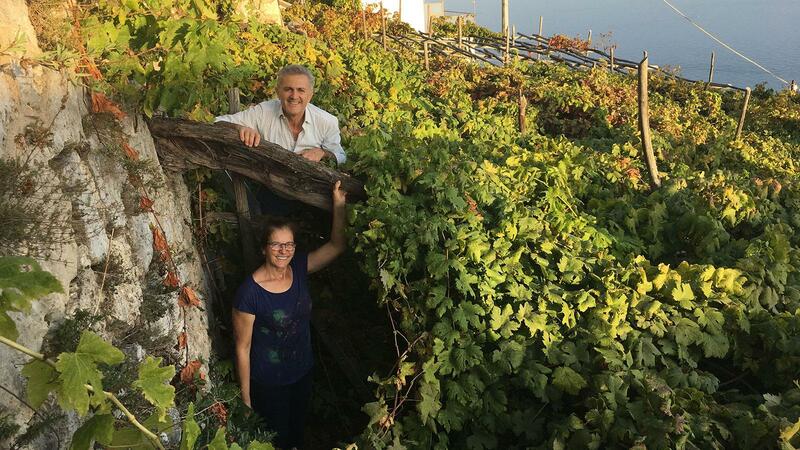 Today, after 35 vintages, the couple cultivates 34 acres of vines in and around Furore and buys grapes from another 67 family growers on the Amalfi coast whose plots spread over 40 acres. They employee 28 full-time staff, including one guide who coordinates visits from Amalfi’s constant stream of tourists. Cuomo's old, steep, seaside vineyards demand labor-intensive harvests. Marisa Cuomo makes nine wines, totaling more than 16,500 cases. Reds and a single rosé combine highly tannic Aglianico with Campania’s softer blending grape, Piedirosso. Most whites mix Falanghina with Biancolella. Cuomo’s top white, the aromatic and spicy Fiorduva (2012, 89 points, $75), is made from co-fermenting the obscure local Ripoli, Fenile and Ginestra varieties from different Furore vineyards. Back at the winery, Cuomo takes a break from filtering white wine with their son, Raffaele. The Amalfi coast is one of the world’s most romantic and glamorous settings, but Cuomo’s life as a winemaker and cellar master hardly matches that image.